This is one of those excellent religious Sorrento music boxes. 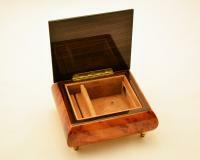 The box is made of elm wood. The music box is polished to a perfect gloss finish without obscuring the beauty of its burls. 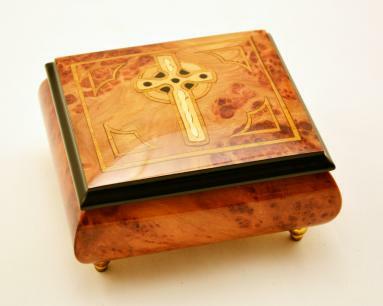 The lid of this Sorrento music box is inlaid with a Celtic cross within an artistically inlaid rectangle on the lid. This is an apt gift for any staunch Christian. 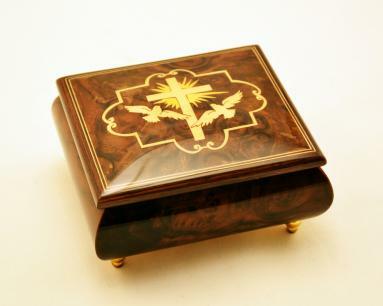 The music box contains a jewelry compartment lined with velvet. Jewelry compartment lined with soft velvet.